Anyone who came to the fabulous TDP Foreshore Forum back in December 2012, might remember that I presented a paper describing my first tentative steps in researching the history of whaling operations based in Rotherhithe through the 18th and 19th centuries. This was prompted by the discovery and recording of two lengths of whale mandible, incorporated into a timber structure on the foreshore at Rotherhithe. Naturally then, I was delighted to hear that the theme of the annual Docklands History Group Symposium held in March 2013, was the London Whaling Trade. Stepping out of my door on the morning of the conference, I was greeted by an Arctic-worthy blizzard. But, being a hardened FROG member, I made my way to the Museum of London Docklands, to be greeted by a very welcome cup of coffee and a nice warm lecture theatre, where I was very pleased to see I was not the only FROG member in the audience! Safely installed, we were treated to a day of fascinating papers. Janet West gave an overview of London as a whaling centre from 17th to 19th century, and introduced her own research, using high-resolution photography to analyse scrimshaw designs. Alex Werner profiled the extraordinary and meticulous work of A.G.E. Jones, whaling historian, who, from the 1940s, poured through shipping records and insurance registers in order to index the voyages of London whaling ships. The detail and accuracy he achieved was remarkable – he inventoried 15,000 movements of whaling fleet ships, from 15 million items in Lloyd’s List and was able to recall and cross reference them – all before the development of computerised databases! Next, and particularly relevant for me, was Alan Pipe’s appraisal of archaeological whale bone material from London. I was, once again, impressed by the small quantity of archaeological specimens excavated, in relation to the scale and importance of the trade spanning over two centuries. It was also interesting to note the diversity of excavated species (7 types of large marine mammal), and the uses these implies (including meat consumption, artefactual objects and processing waste). Chris Ellmers’ descriptions of the Greenland Dock was also extremely useful for situating my personal research. Alongside a more formal history of the development of the dock, Chris conjured up the atmosphere of the place (in particular the smell – putrefying blubber anyone?) and described some of the weird, wonderful, and horrific events there including the tale of a whaling captain who fell into a blubber rendering copper and died of his wounds… These built up a picture of a place that was deliberately constructed at the time as exotic, unsavoury and wholly ‘other’ in contrast to the ‘civilised’ city. Beatrice Behlen introduced another social aspect of the whaling trade: the harvesting and various uses of baleen (keratin strips that form the filter-feeding system of Baleen whales). The talk included wonderful images and descriptions showing the chain of processes involved in preparing baleen for use. This included specialist craft-workers, tools and workshops. Baleen was soaked, scrubbed, sawn, boiled, and cut lengthways, to produce strips that were extremely valuable (often stolen), and sold for the production of fashionable garments and other items (including corsets, stays, umbrellas, hats, boots and etc). 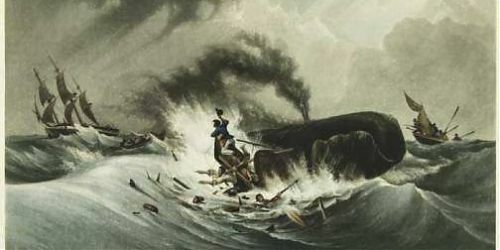 Charles Payton evoked the world of the Enderby family, whose fame in whaling was immortalised by Melville’s description of the ‘gam’ between the Pequod and the Samuel Enderby. Despite this, surprisingly little has been published about the family. Given the scarcity of material, the talk provided remarkable detail about the rise of their vast whaling operation over successive generations. Finally, Richard Sabin described the work of the Natural History Museum to identify and analyse the skeleton of the North Atlantic Right Whale, which was excavated at Greenwich in 2010. This was an extremely exciting paper, continuing the story presented by Stuart Watson of Pre-Construct Archaeology at the TDP Foreshore Forum in 2011 of the dramatic rescue mission to safely remove the entire skeleton before the tide came in. Richard demonstrated the possibilities of combining scientific analysis with historical research, in order to investigate past stranding events. He also highlighted the importance of the museum’s extensive and world-class reference collection of marine mammal skeletons, and the significance of data collected by the on-going Cetacean Strandings Project, based at the museum, which provides vital information for monitoring whale populations around the British Isles. This was an extremely rich and varied selection of papers, and I came away bursting with ideas and enthusiasm for the subject. I am struck by the amount of material and information that is available if only we show enough interest to look for it. Whaling continues to hold a grim fascination, but it is something that London in general appears to have largely forgotten, or suppressed. Perhaps this is not surprising given that very little in the way of sites or archaeological traces survive to testify its legacy. It must also link to a distaste for such themes in our enlightened times, when a compulsion to save species has supposedly overtaken our bloodlust and desire to hunt them to the brink of extinction. The day left me pondering how the relevance of these studies, which I believe are so important in understanding many of the processes which continue to impact us today (globalised trade, pursuit of un-renewable energy sources and raw materials, and species endangered by human activity), can be brought to a wider population. It has also got me fired-up about continuing my own research, and I certainly await the publication of the symposium proceeding with eager anticipation!